Fully modified by our airsoft experts in collaboration with Airsoft Surgeon, T.S.E.E stock system & tactical rails makes this popular shotgun a versatile and menacing weapon. Upgraded to 400fps if powered by TOP GAS. This tactical shotgun feels more like a sniper rifle with aimpoint style red-dot scope, laser targeting system and flashlight. Together with the tactical T.S.E.E. 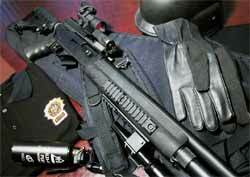 stock, this shotgun is a very viable entrant into the newly founded IPSC shotgun category. Very handsome and unique looking indeed!